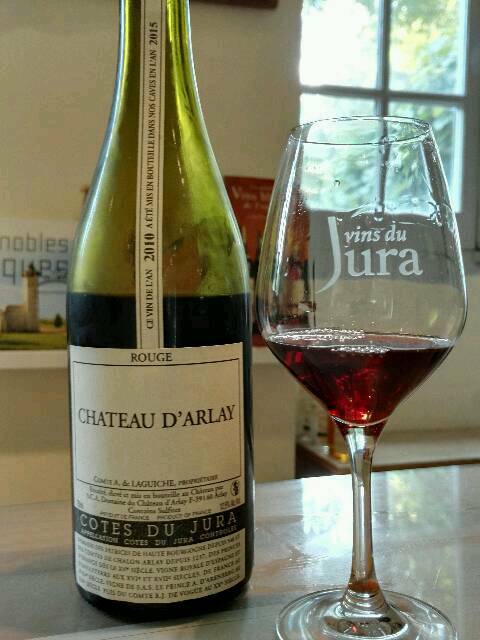 It was an easy choice for me, which of the Jura wineries would be my first one to review. 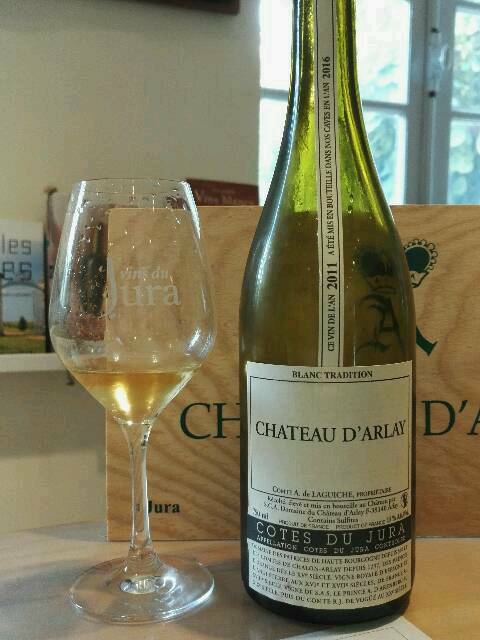 There could be only one, and let it be Château d’Arlay, the one that sparked my love for Jura whites, many years ago. 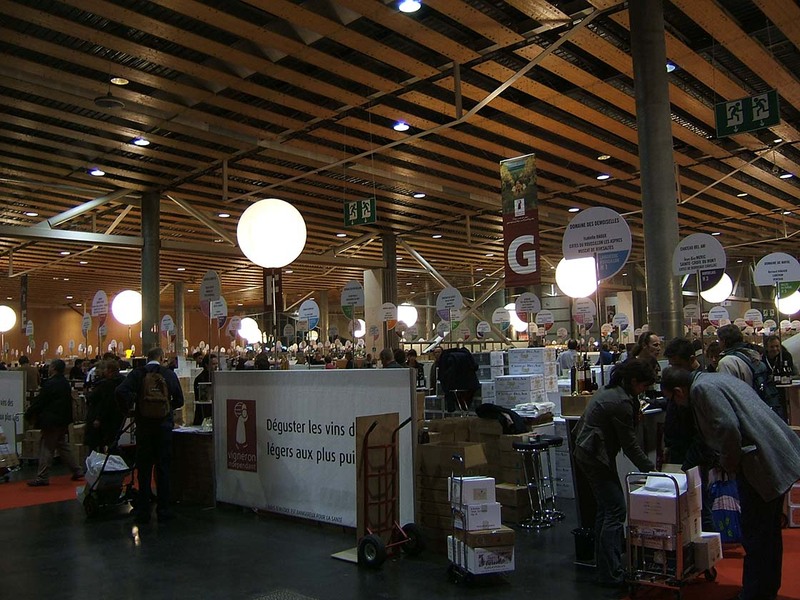 Around 600 independent winemakers at the Salon des Vignerons Indépendants. Lille, France, 2010. Mr. K and I tend to go to the Salon des Vins des Vignerons Indépendants in Lille. With almost 600 independent winemakers present from all over France, it’s the perfect place to revisit wineries whose wines we’ve liked for years, and to discover new domaines, regions and wine styles. Most of the time we have a clear plan of action for the fair, knowing exactly what we want to taste, but every once and a while we like to just walk around and see which booths, or rather winemakers, catch our interest. Often enough, the instinctive and emotional part of our brain recognises passionate people, well before our conscious mind can. 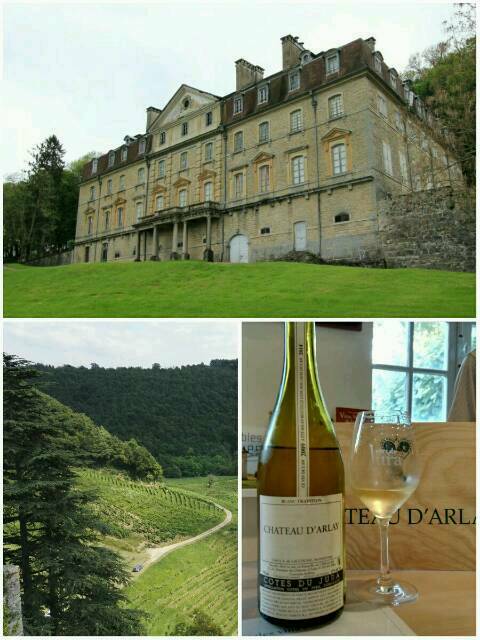 Château d’Arlay is an 18th-century neo-classicist castle, built on the site of a 17th-century convent, in an area that has been inhabited for thousands of years, dating back to well before the Romans, as a station on one of the historical salt trading routes in Europe. The vineyards around the castle are among France’s oldest continuously-worked vineyards, and the region as well as the local noble families have played their part in the turbulent history of several European countries, including Belgium and The Netherlands. As a side note, the current Dutch king, Willem-Alexander, still holds the title of ‘Baron of Arlay’. But let’s talk wine instead of politics. 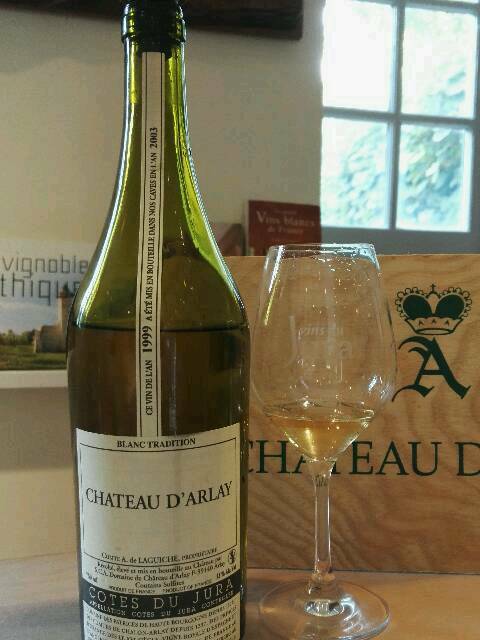 Château d’Arlay produces red wines as well as whites. No Crémants. A few years after we first met, we asked the Comte why, and he admitted that for historic reasons, he was more of a champagne drinker himself – a fact I would never hold against a person, for sure. Also: the winery already has such a diverse range of amazing wines, I’ll happily forgive them for not adding a sparkler to the mix. Throughout the years, I have tasted (and bought) a good number of their wines, and frankly, I’ve never found one I didn’t like. Every single one is a great-quality, classic example of competent winemaking, showing class, personality, a good balance of elegance and depth, and great ageing potential. Wines that continue to intrigue and surprise. 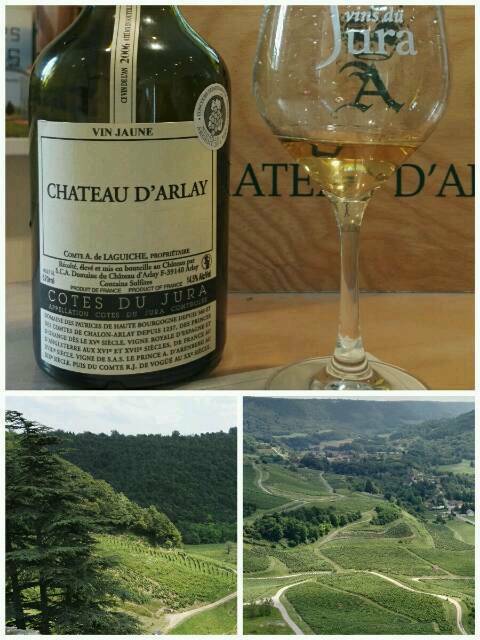 This summer, we finally made it to the Jura, and we were fortunate to be hosted by one of Château d’Arlay’s charming and highly knowledgeable staff members, Didier, who guided us through an extensive tasting of the domaine‘s wines. If you would like more information first about the wine types and styles of the Jura, have a look at my introduction to the Jura. Otherwise: enjoy the reviews! Les Pavillons du Château d’Arlay 2015. AOP Côtes du Jura, Jura, France. 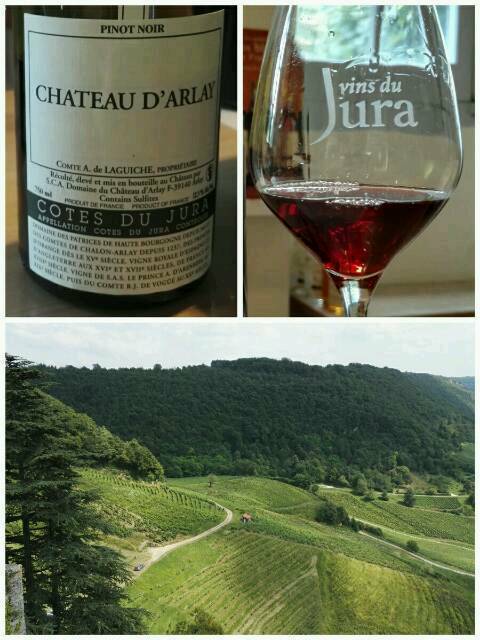 The French Jura is one of the few wine regions in the world where tastings start with the rosé and red wines. For a good reason, because these are generally light, and their whites can be rather peculiar and powerful. This is a fruity, juicy and characterful rosé, blending Pinot Noir and local red grape variety Trousseau. Fragrant and fresh, it opens with raspberries, strawberries and grapefruit, after which a more herbaceous, citrus-zesty side takes over, ending fairly long on a nudge of grapefruit bitter. In its genre, definitely worthy of 4 stars. 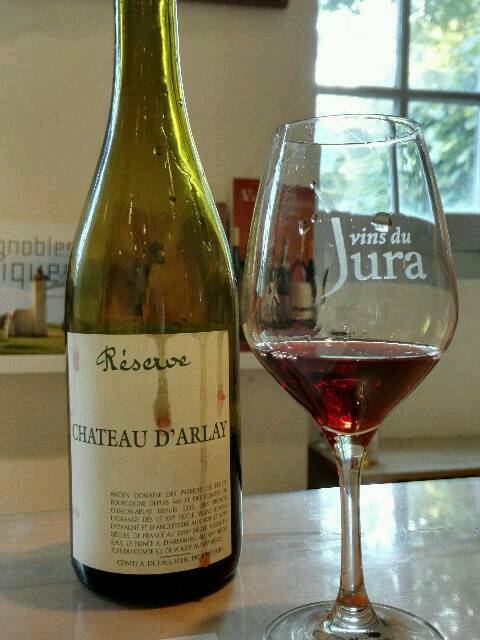 However, for many red wine lovers, this Jura red will be a little light-bodied, like they tend to be. It’s a great example of their reds, though, composed of Pinot Noir, Trousseau and Poulsard, mixed with a bit of Chardonnay and Savagnin. A beautiful light-red hue anticipates a fruity and floral perfume, supported by herbal and light game notes, high acidity and a pinch of spice on the palate. Versatile, food-friendly ánd intriguing wines. Showcasing the winery’s quality – in reds as much as in whites. Château d’Arlay. Cuvée ‘La Réserve’. 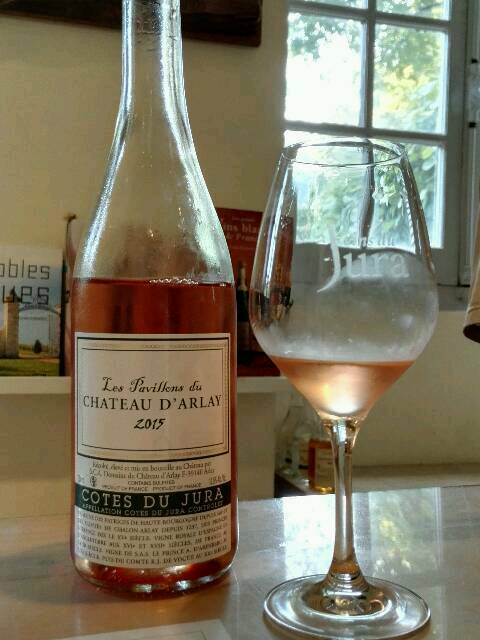 This Réserve is again a great example of Château d’Arlay’s winemaking expertise, presenting a surprising spicy, peppery and rose powder-scented, cherry and blackberry-fruited cool-climate red. It’s a blend of Pinot Noir with Jura locals Poulsard and Trousseau of the 2011, 2007 and 2004 vintages. High acidity and medium tannins make this a very accessible and food-friendly wine. This will easily complement refined poultry or feather game dishes, but it can just as well lift hearty, home-cooked pastas or meat in herb-rich tomato-based sauces. Château d’Arlay. Pinot Noir 2010. 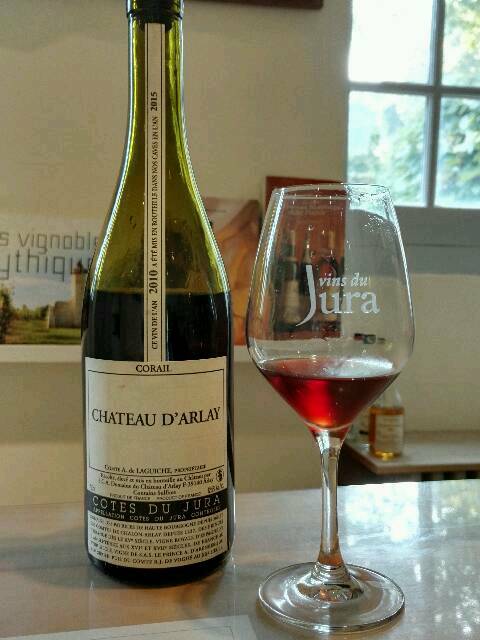 Pinot Noir is in France most associated with Burgundy, but here in the Jura, at Château d’Arlay, these Pinot Noir reds have been around since the 15th century. We compared different vintages of this one, with the 2011 and 2008 being my favourites. Aromas & flavours of red cherries, forest berries and bread crust, with a touch of spice and dusty roses. Good acidity and medium tannins make this a very promising gastronomic wine, but it is still young; it needs a few more years in the cellar. Château d’Arlay. Pinot Noir 2011. This is a great Pinot Noir, from a wine region where you wouldn’t automatically go look for them: the Jura. We tasted different vintages and the 2011 was definitely my favourite: still young, but with unmistakable potential. This lighter red shows a good balance of intensity and finesse, and pure flavours of ripe raspberries, redcurrants and dark cherries over layers of underbrush and sandalwood. Add vibrant acidity and mild tannins, and it makes an excellent, versatile food wine for elegant white meat, game or vegetarian dishes. Château d’Arlay. Pinot Noir 2008. It was interesting to taste how Château d’Arlay’s great Pinot Noir ages, and based on these examples: very well. This 2008 has a long life ahead, only starting to show the first signs of tertiary development with subtle layers of forest floor and mushrooms enhancing the lively berry fruit and lightly-spiced character, over vibrant acidity and mild tannins. This is the kind of wine that makes you dream of colourful autumn walks that end with a perfect dinner of feather game & wild mushrooms. Château d’Arlay. Chardonnay ‘A la Reine’ 2013. 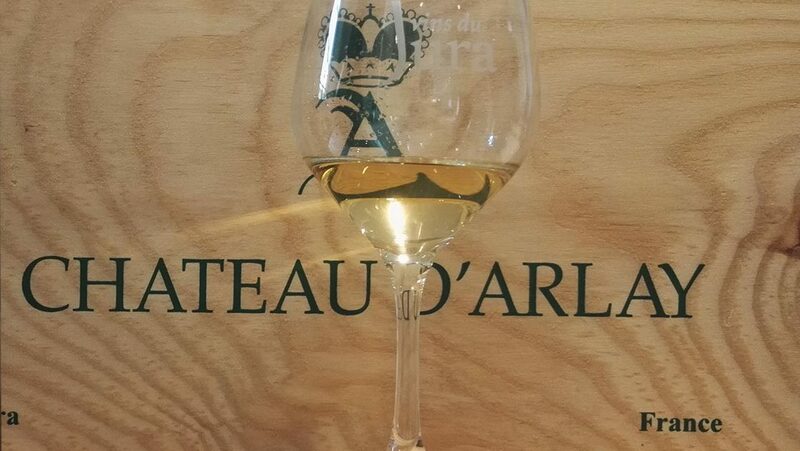 Château d’Arlay also makes a delicious varietal Chardonnay, fermented and matured in stainless steel, yet it’s got that unmistakable Jura character of oxidised apple, spring flowers, citrus pith, nuts and dried figs, over a palate with lively fruity acidity, intense mineral impressions and a saline nudge that lasts well into the long, lipsmacking finish. Unique in character, and very food friendly; think white meats and fish in sauces, cheeses and butter-pastry quiches. Old vines harvested at high ripeness. Château d’Arlay. Chardonnay ‘A la Reine’ 2005. 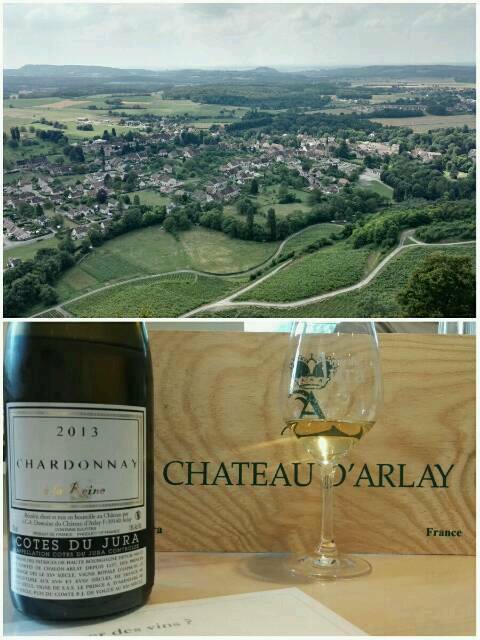 As a testimony to this Chardonnay’s longevity, after the 2013 we tasted the 2005 vintage, where the intensity of the ‘vieilles vignes’ and the character of the Jura ‘à la Reine’ terroir has integrated and matured into a cornucopia of ripe and dried fruit, stony minerality and a range of nutty and aged cheese-like aromas I would associate with Jura Savagnin instead. Almost like an oxidative wine, but with a distinct fruity & floral freshness, lifting the roundness and the deep, intense flavours. Gastronomic! Château d’Arlay. Blanc Tradition 2009. This is the wine that started my love affair with Jura whites, many years ago at the Lille wine fair. 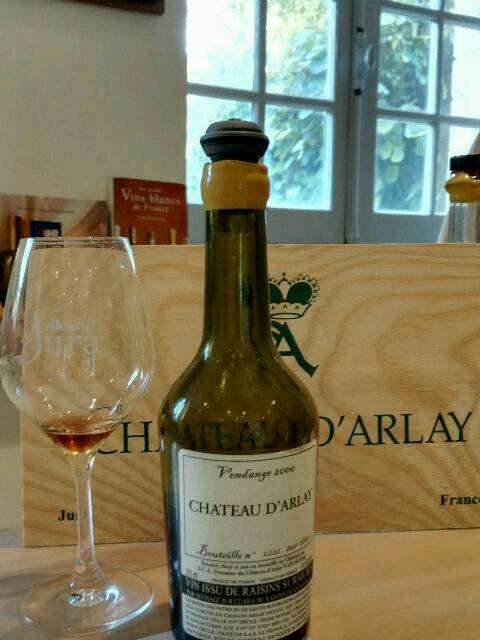 At that time it was the 2004 vintage, in fact, but Château d’Arlay manages to produce these wines with a consistent high quality. This blend of Chardonnay & Savagnin is young still (these Jura whites are incredibly long lived), with intense flavours of dried fruit, crushed apple, nuts & curry, and a close to perfect balance of acidity and roundness. Château d’Arlay. Blanc Tradition 1999. Jura whites tend to be very long lived, especially the oxidative ones. Like this blend of 2/3 Chardonnay and 1/3 Savagnin Blanc (not to be confused with Sauvignon Blanc – the two are very different varieties). After tasting the 2009, we got a sample of this 1999, bottled in 2003 after spending those years in non-topped-up barrels. By now the Savagnin character has taken over, showing complexity, a creamy mouthfeel, salinity and freshness, marked by curry spices, browning apple and walnuts under a delicate veil of spring flowers. Château d’Arlay. Blanc Tradition 2011. After 2 older vintages, we got to taste the recently-bottled 2011 edition of this Chardonnay/Savagnin blend, which is still way too young to have come close to its full potential, but it was already delicious nonetheless. Very nutty and floral, revealing the warm perfume of honeysuckle with a touch of rose petals, which I haven’t encountered before in this wine style. Soft notes of fresh ginger and savoury curry spices fill out the nose, and it’s all carried by a creamy, full-bodied, fresh & mineral-infused palate. Château d’Arlay. Vin Jaune 2006. I almost feel like I’m handing out too many 4- and 4.5-star ratings, but hey, it’s Château d’Arlay and their wines are worth every one of them. 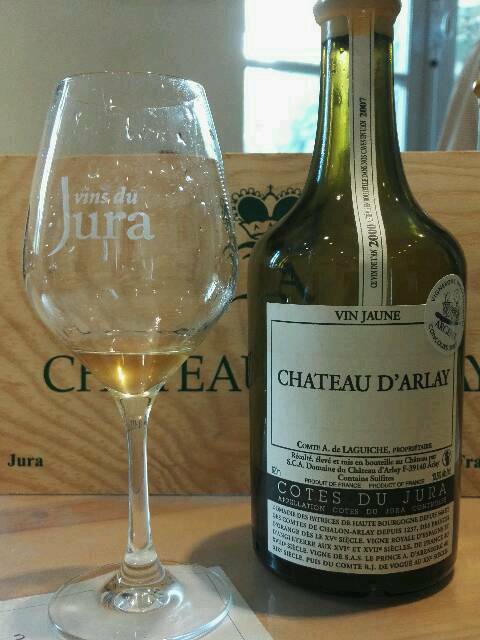 This vin jaune, a flagship wine of the Jura, is a very special one. First of all, it’s young still – because these can age for many, many decades, possibly centuries. But it’s also less creamy and oxidised-apple-and-dried-figs-fruity than many vin jaunes. Instead it shows more of a floral, spicy and nutty character. 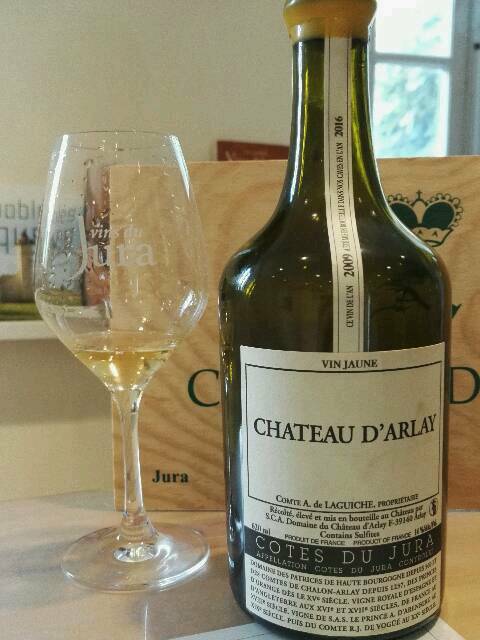 Intriguing, intense, peculiar & delicious – everything you hope to find in a vin jaune. Château d’Arlay. Vin Jaune 2009. Vin jaunes have such a strong personality that one can get the impression they all taste a bit alike – until you taste several in one flight. Then you notice how different they can be, from one producer to another, or because of their age and vintage, as is the case here. The 2009 was only bottled this year (and it’s vinfanticide tasting it so soon) but it already hints at its future self. Very saline, this one, with plenty of crushed apple, savoury spices, autumn-evoking chestnuts and a slight astringency. Patience is required! Château d’Arlay. 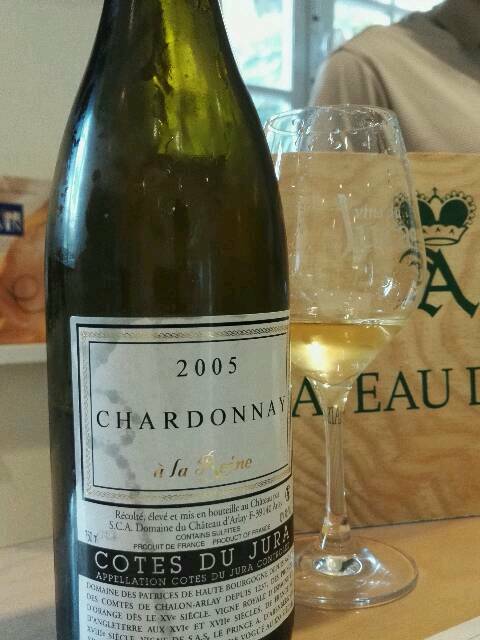 Vin Jaune 2000. This vin jaune has many, many decades ahead, but it’s already in a good place, in spite of having been bottled only 9 years ago, which makes it a kindergartener in vin jaune terms. It is the kind of intense but elegant and profound, nutty, curried, saline wine, that makes you dream of autumn comfort food dishes like poultry-and-mushroom ragout in a decadently creamy vin jaune sauce, feather game with root vegetables and wild mushrooms, or elaborate cheese platters with dried fruits and nuts. An endless finish! Château d’Arlay. Vin Issu de Raisins Surmuris 2000. A Vin de Paille that’s not a Vin de Paille – this one was made outside of the appellation because it was atypical, but according to a similar process, from overripe and dried grapes. Complex and concentrated, with a fascinating spicy and peppery character that flows as a savoury undercurrent underneath layers of dried fruits, from raisins to prunes, cinnamon and chocolate. It’s got quite a unique texture as well: soft, smooth and sweet, with a lovely lift of fruity acidity, without being syrupy or cloying. 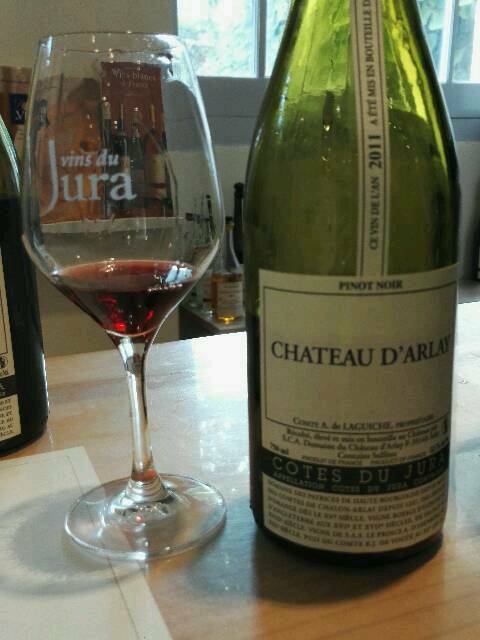 Previous story Oh Jura, How I Love Thee! What an incredible experience, Kristel! As always, thank you for sharing it so beautifully. There is nothing to add, nothing to substract from your quality post and very professionnal comments. I’m happy to see you’d love the wines and your stay. Thank you for your kind words, Kristel. It’s great to see you here, Didier, because now I can thank you again for the unforgettable tasting we had with you this summer. Un grand, grand merci, et à la prochaine visite!